Abbott Optium EZ Blood Glucose Test Strips feature TrueMeasure® technology that provides accurate results. These glucose test strips give results in 5 second test time. 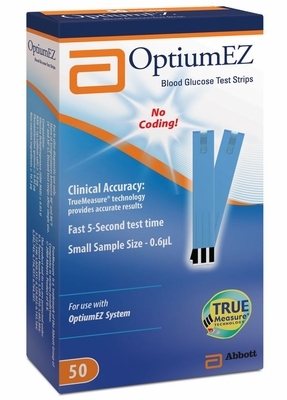 OptiumEZ diabetic test strips only require a small 0.6uL sample size. For use with OptiumEZ Systems. Sold by box and case quantities.